Just a few days ago, I was honored to be invited as one of the members of food tasting panel and to share my two cents on the upcoming 22 dishes that RIVA (yup 22, you heard that right) will introduce to the public pretty soon. Attention to detail. 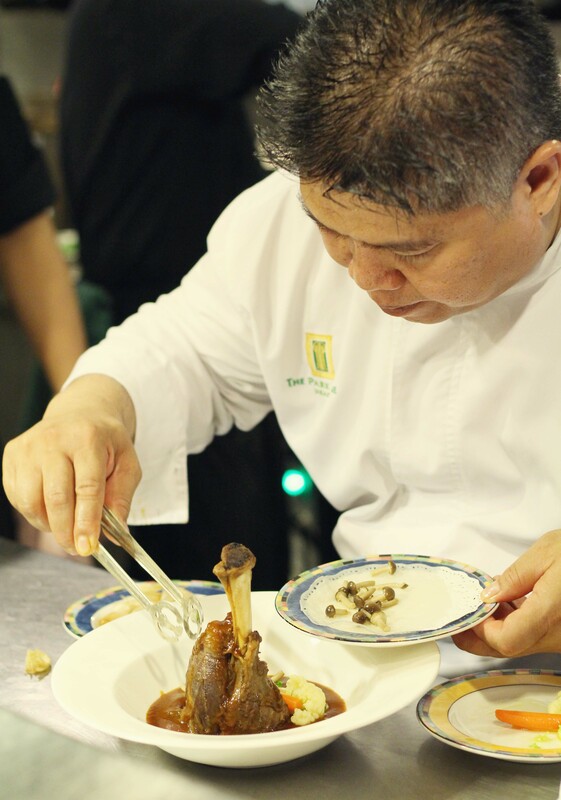 Chef Deden decorates the magnificent braised lamb foreshank. So, in-between observing the very busy kitchen that serves each dish meticulously and also distributing it evenly to all of us in tasting portions, I got the chance to see the benevolent Chef Deden Gumilar in action. He did all the details by himself, oversaw everything with such focus, and still kept his humor at the same time. One of the best mains that day was this braised Australian lamb shank, soaked with its own jus and served with potato mouselline. The many hours it took for braising made the meat not only tender and still juicy, but you won’t have to do much effort to separate the meat with the bones. Unlike the tricky lamb chop, the foreshank is meant to be made this way, served bold and beautiful, and it was one of the best shank that I ever had in my entire life. I hoped that the score sheet we marked during the tasting could help to motivate the kitchen team and also improve some stuff, but for this one, you can’t ask for more. It’s already good as it is!